After lunch we hopped on the MRT again, this time to the Botanical Gardens which, conveniently, has its own stop just outside the park gates. 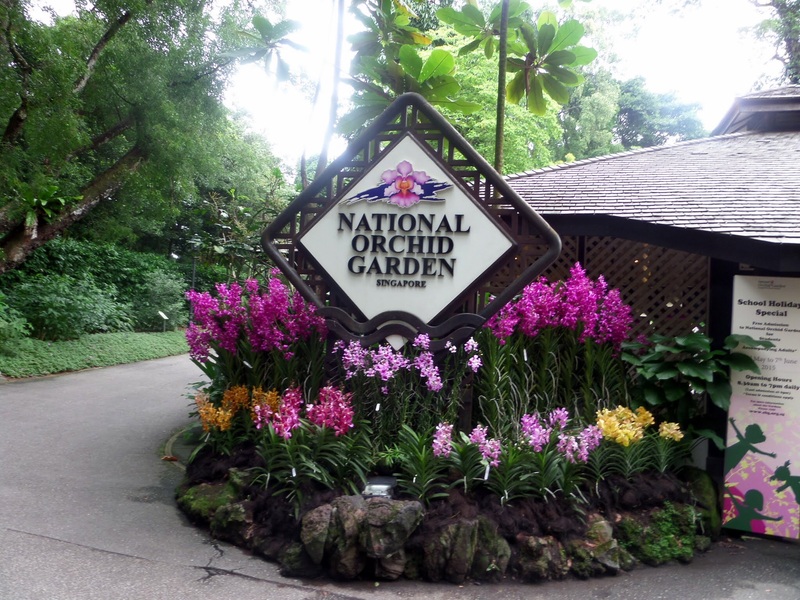 Admission to the Gardens and lake area is free but there is a small charge of $5 to enter the National Orchid Garden. This small entrance fee was definitely worthwhile as the orchid gardens are extensive, featuring zones covering differing climatic conditions. The flowers were exquisite and very fragrant and I feel certain that even non gardeners would enjoy them. After wandering around other sections of the main gardens it was time for afternoon tea. 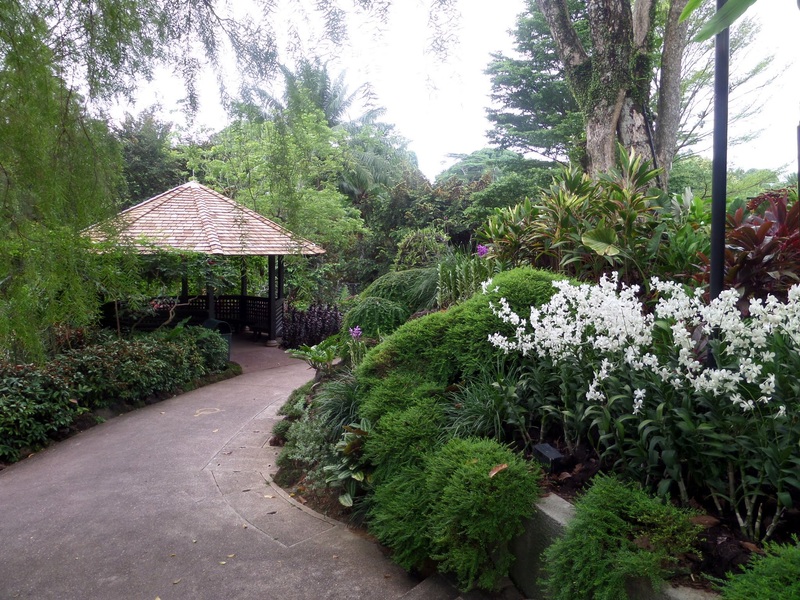 The cafe / restaurant in the gardens is called The Halia Tea Rooms, Halia being the Malay word for ginger. The majority of the seating is under hibiscus covered terraces with large, colonial style rattan fans. The tables have starched white cloths with little vases of fragrant orchids and best of all it’s actually great value. We returned to the hotel for an early evening swim on our hotel’s rooftop then it was back to the Esplanade for dinner at Makansatra / Gluttons Bay hawker centre again. It wasn’t quite so busy this evening and we shared a large circular table with a group of locals who were all very friendly. The food is delicious, cooked to order and amazingly cheap. Tonight we opted for Chicken Rice which, although simple is absolutely delicious, the chicken steamed in a delicately flavoured broth, Satay sticks and large glasses of the local Tiger beer. Interestingly, these glasses with handles are referred to as ‘mugs’ over here, they are what in the UK we used to call tankards. We walked back along the river to our hotel in Clarke Quay stopping for our obligatory ice creams on the way. I thoroughly enjoyed reading about your Singaporean adventures. We definitely need to get our tails back there, and soon! I also want tomake a return visit to Singapore, I just love it. Thanks for your much appreciated thoughts, it’s so nice to hear from you. Your words and pictures remind me about why I like Singapore. And you’ve also given me ideas about new places to see next time I’m there. Thank you. Thank you for taking the time to read my Singapore posts and it’s good to read that you found them useful.